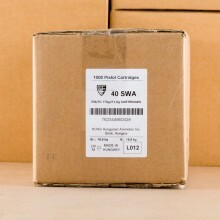 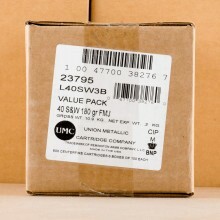 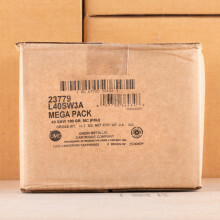 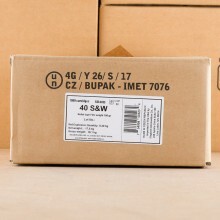 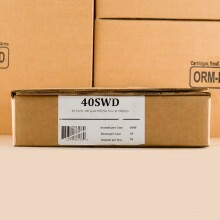 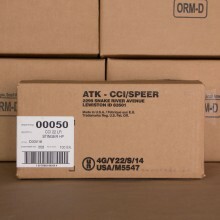 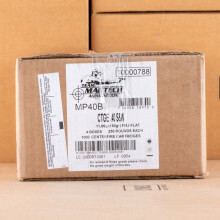 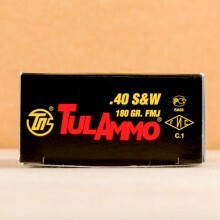 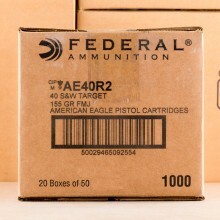 40 S&W AMMO IN BULK SHIPS FREE FROM AMMOMAN! 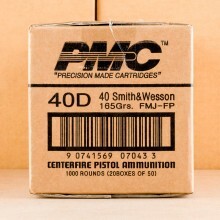 The Federal Bureau of Investigation, Smith and Wesson and Winchester designed 40 cal ammunition to be a law enforcement cartridge and potential replacement of larger 10mm round. 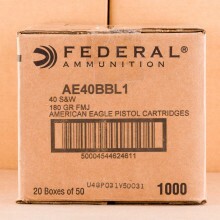 Loaded to relatively high pressure and small enough to allow many rounds to be comfortably carried, the .40 S&W round is a great round for self-defense and a popular choice among law enforcement today. 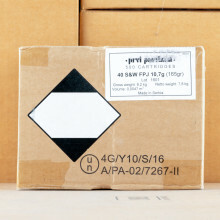 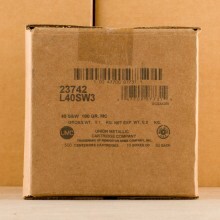 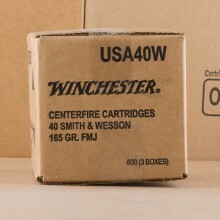 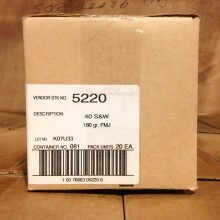 Bulk .40 S&W Ammo In-Stock Today! 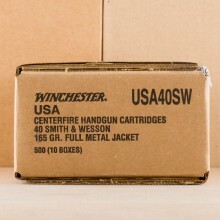 40 Smith and Wesson handgun ammunition is extremely popular among law enforcement and shooters that crave a good round for self-defense. 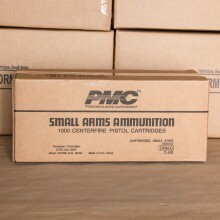 40 cal rounds provide more energy than 9mm Luger while delivering nearly identical drift and drop and accuracy. 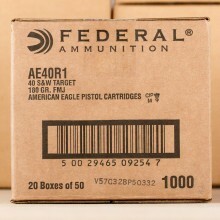 40 cal rounds come in a wide range of weights, from as light as 135 grain to as heavy as 200 grain. 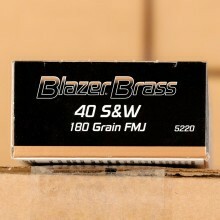 Although, most shooters would consider 165 or 180 grain standard for most range or self-defense use bullets. 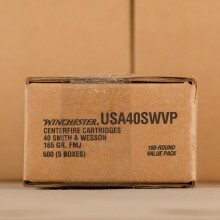 In terms of muzzle velocity, you'll find the fastest .40 SW rounds travel at about 1,200 feet per second. 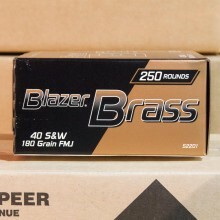 Larger rounds pack a punch with some 180 grain rounds promising close to 1,100 feet per second of muzzle velocity, good for more than 450 foot-pounds of energy. 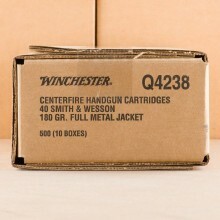 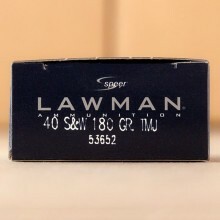 Here at AmmoMan.com, we're proud to consistently offer an assortment of jacketed hollow point (JHP) rounds for self-defense as well as full metal jacket (FMJ) projectiles that are more frequently used as training ammo at a shooting range. 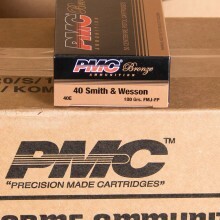 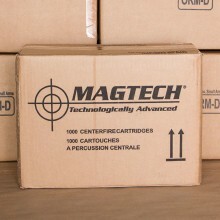 When it comes to manufacturers in-stock, you're likely to find PMC, Federal, Blazer Brass, and Remington 40 S&W ammo for sale here at AmmoMan.com. 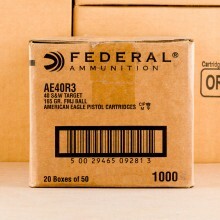 Look for Hornady, Federal Hydra-Shok, or Remington's Golden Saber if you're hunting for a good round to use for personal protection/self defense.